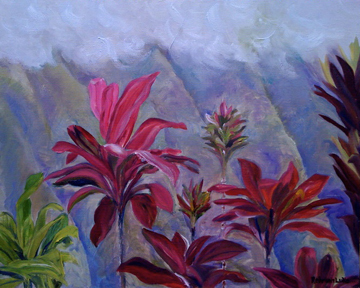 For the Hawaiian Makahiki and the American Thanksgiving season, Rebekah’s Studio offers a meditation from 2008. That it is easy to see our Source. Reprinted from ‘Umeke Writings: An Anthology, edited by Rebekah Luke and Meleanna Meyer, published by Na Kamalei—K.E.E.P., 2008 (ISBN: 978-1-935111-00-9). 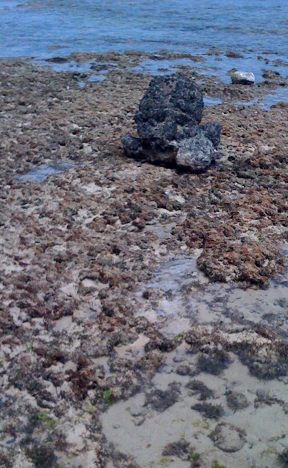 When the tide is low I can walk far along the beach and hardly notice any bothersome civilization on Kamehameha Highway. Not a minus tide, but a slow gradual ebb to just zero, long enough to walk from Swanzy Beach to Kalaeokaoio and back, completely on the sand, at least two miles worth. The air is so cool. The few houses between the water and the road and the rustling of coconut palm fronds muffle any traffic sounds. It’s easy to notice the bird songs mixed with the audible rhythm of waves breaking on the horizon reef and the quiet crackles-and-pops from the emerging tide pools. The wide beach lures out kids and grownups one by one to play. An older couple in bathrobes enjoys coffee and scenery from their lawn chairs. A kolea pauses. Smells of limu. Tastes of salt. On the return trip I rescue flowered lavender flip-flops left by a little girl playing in the sand. An amusing sculpture surprises. Oh, … hello! Back in the studio and examining the tide calendar, I see the next similar low tide will be next week on May 1, 2 3, 4 and 5 — in the morning. If you go, give thanks and always keep a watchful eye on the sea. Already the middle of March and approaching the equinox! Good fortune has indeed gathered at the front door since the lunar year began. My fortunes include a potential gallery venue to show my paintings this year, freelance copy editing and proofreading income, and an extra green trash can from a neighbor for our garden trimmings, just when I wished for them! What else is new in this light? I am reading Jamling Tenzing Norgay’s book Touching My Father’s Soul, on loan from another good neighbor who has trekked in Nepal. He promises I’ll like it — the book (agreed) and the trekking (if only . . . now that’s what I call a goal!). You may click on the title to read some reviews. Our granddaughter, who comes to the studio several times a week now when her parents are away at work, turned 10 months, and she’s so tickled to walk on her own. Look out, world! I find myself reflecting on my toddlerhood — yes, I can remember all they way back to then — and appreciate all the more the extended family, uncle, aunt, and neighbors, who took care of me. Which brings to mind a new meditation I’m doing. It’s called “Installing Inner Game” by Devon White. You may check it out at this website: www.gogratitude.org/devon. It requires T-O-T, time on task. So far I have listened to the 70-minute audio message and read the manual one time each. Although I’ve just started this program, my guess is that it helps take you all the way back to who you were in the beginning, as well as all the way forward in terms of becoming and being at your best to fulfill your life’s purpose. How cool is that?! We all need healing every day. So not only good fortune, but peace at the front door as well. Thank you! Here’s a painting of tropical Hawaiian ti plants I finished on location this week, just as a sudden downpour drenched everything and left me in a puddle. Today begins the third wave of Go Gratitude stewarded by Stacey Robyn. I participated in the first and second waves. It consists of short meditations that are emailed to you, one each day for 42 days. Wonderful things happen when people around the world, notified through the internet, meditate together about gratitude. Soon, we may reach the critical mass, and then what?!!! For those who want to join the experiment, you may click on the following link. Afterwards, clicking your back button will bring you back to Rebekah’s Studio. One day at my morning water exercise at Pohai Nani, our substitute trainer mentioned to the class, “Read messages in water.” That was it. No context, except that we were in the water of a swimming pool, and no author given. A few days later, my son-in-law handed me a paperback, saying, “Have you read this?” You guessed it: The Hidden Messages in Water by Masaru Emoto. It tells and shows that water carries messages, that it can be photographed in its crystalline state, and that the word gratitude in any language creates the most beautiful crystals. About the same time came Stacey Robyn’s invitation to the first wave of Go Gratitude. In the first wave, she introduced the symbol for gratitude and pointed out the pattern that is so prevalent in nature. We have only to look around. I also noticed it was similar to the symbol I was taught to use for practicing Reiki. For five years up until the spring of 2009, I was involved as a book designer and project manager to produce 20 bilingual toddler’s books in Hawaiian and English. They were created and published by Na Kamalei—K.E.E.P. to promote family interaction in the home through reading. The book series was a remarkable accomplishment by the community of Ko‘olauloa that wrote the stories. While the “Stories Told By Us” project was remarkable in itself, the Na Kamalei—K.E.E.P. book that touched my heart the most was one for adults that came out of a workshop given by Hawaiian art educator extraordinaire Meleanna Aluli Meyer on “Creativity” in which she guided participants in drawing and writing. She asked us to think about what we are grateful for. As members of the group shared with each other what they had written, I immediately noticed the makings of another book. It’s entitled ‘Umeke Writings: An Anthology. I am so very proud of it. It’s about gratitude, and it contains short writings, art work, and photos entirely by 20 grateful Hawaiians. It’s like Chicken Soup for the Soul, Hawaiian style. Mahalo to Kamehameha Publishing for providing the resources for Na Kamalei—K.E.E.P. to publish it. And mahalo e ke Akua! Meleanna said afterward, she gives these workshops frequently, but never before had she experienced such synergy. If you come for a Reiki session with me, Oe-Len, I will give you a copy of the book as long as my supply lasts. Lastly, for today, I wish to share a couple-three more links, just to let you know from where I am coming. (I realize we are all on our own journeys. If you are reading this blog, then for a few moments you are on mine! For me, sometimes it is easier when someone else just tells me something than when I have to learn it on my own. Sometimes I don’t know what questions to ask.) You may pass on this if you wish, however . . . In the middle of the night before last, something awoke me, and I and was led to my computer to check my spiritual CNN. I found these articles for September 2009 very enlightening. The first two are “The Wonder of It All,” and the third is a message from Archangel Michael about the violet flame. Here are the links. Afterwards, clicking your back button will bring you back to Rebekah’s Studio. Because I checked my sources, I am comfortable passing on the information to you. It’s time. The Hidden Messages in Water (Paperback) by Masaru Emoto, translated by David A. Thyme, 2004 (ISBN: 978-0-743289-80-1). ‘Umeke Writings: An Anthology, edited by Rebekah Luke and Meleanna Meyer, published by Na Kamalei—K.E.E.P., 2008 (ISBN: 978-1-935111-00-9).